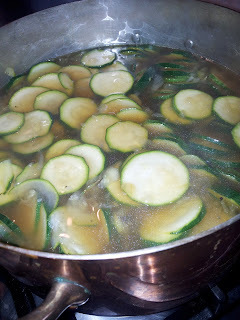 Jeannie's Kitchen: Now what can I do with all those courgettes...or are they zucchini? Now what can I do with all those courgettes...or are they zucchini? My sister Kerry in Dunedin has a problem. She has a glut of courgettes or zucchini. Now that's a problem I envy. Our late in the season courgette in a bucket has not thrived at all. Kerry's plants keep on producing, sometimes from flower to fruit in a day. These abundant fruits are fast losing their novelty appeal and she has requested I give her some new ideas for using them. My latest kitchen addition is this lovely red Emile Henry ceramic bbq plate that can also be used in the oven. It comes with 8 stainless kebab spears that fit into grooves along the sides of the plate. The plate has small ridges and is ideal for roasting anything in the oven - vegetables, fish or meat. This plate will also avoid your vegetarian option being flavoured with meat which is important if you are catering for a vegetarian. oven but not on a naked gas flame. 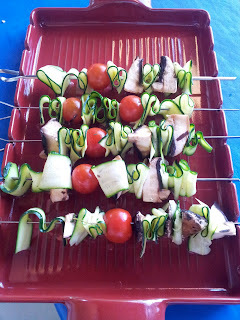 I first make a simple marinade to avoid the cut courgette discolouring and to add extra flavour. I crush a clove of garlic with a little salt, adding a good slurp of olive oil, and half a juicy lemon or one whole lemon (to your taste), and pepper. 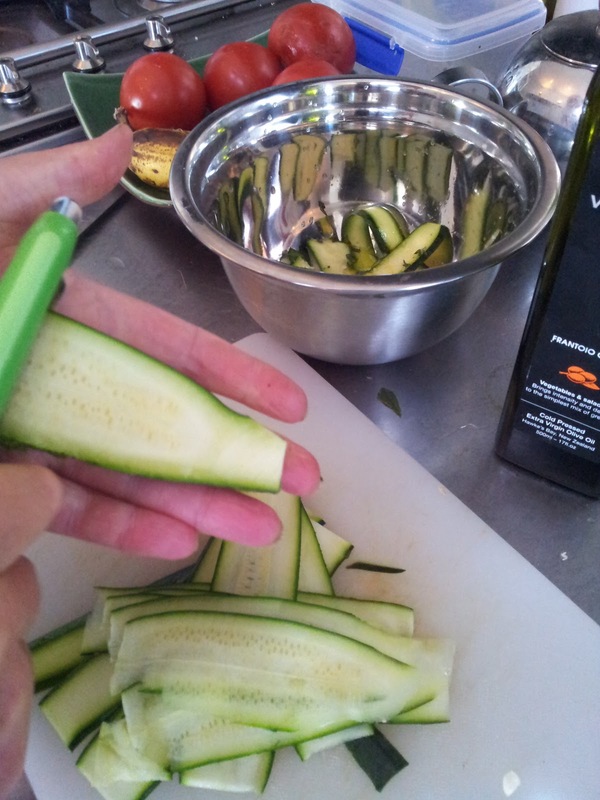 I slice ribbon lengths of courgette using a vegetable peeler. You can also use a mandolin but this is something you have to really concentrate on when using as they can be lethal on fingers. I find for courgettes that cut easily that the vegetable peeler does a good job. The slices have to be thin so that they will bend and thread easily. 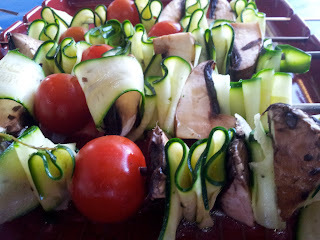 I used about three courgettes. Next I cut up 2-3 Portobello mushrooms - cutting into 6ths or 8ths (depending on size of mushroom). You could also use button mushrooms but I find Portobello has a bigger flavour. I sprinkle a little oil, salt and pepper over them, but this is optional. I also used a punnet of cherry tomatoes to add flavour, colour and juiciness to the combinaton. Now simply thread the courgettes through the sticks...it's a bit like tacking stitch if you sew. (If using bamboo sticks then remember to soak them in water for at least half an hour before using - this avoids them burning.) Follow with a piece of mushroom, more courgette and then a cherry tomato and repeat until the stick is filled. 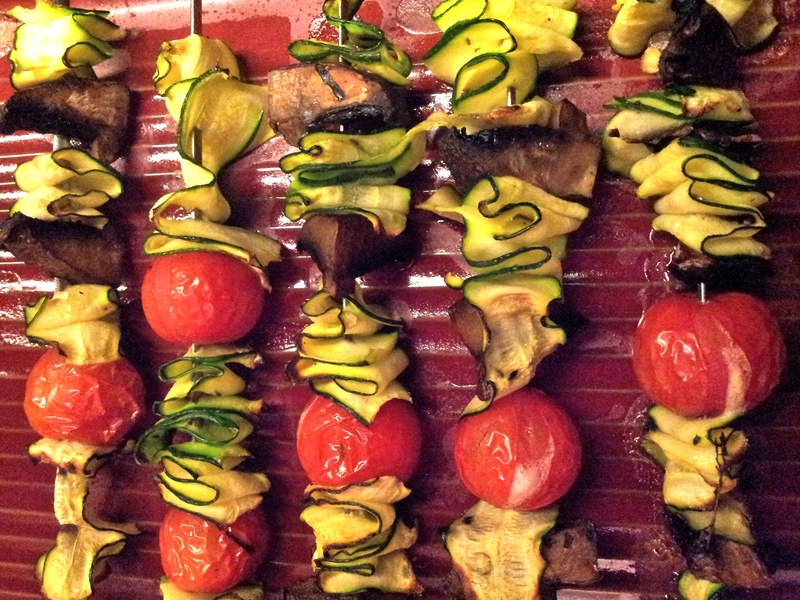 tomatoes are usually the best indicator that the kebabs are ready. Cook at 180 C for around 10 minutes. This is a delicious and fun way to prepare vegetables. If you want a more punchy marinade use this Greek marinade I discovered in Adrian Richardson's "The Good Life" cookbook. Whisk all ingredients together and if not using immediately it can be kept in the fridge for a month. Use this marinade for all cuts of lamb or for brushing onto vegetables that are cooked on the bbq or in the oven. This is easy to make if you grow your own fresh herbs, and the fennel seeds that you can get from any Indian spice shop or collect your own fennel seeds. and letting them dry. 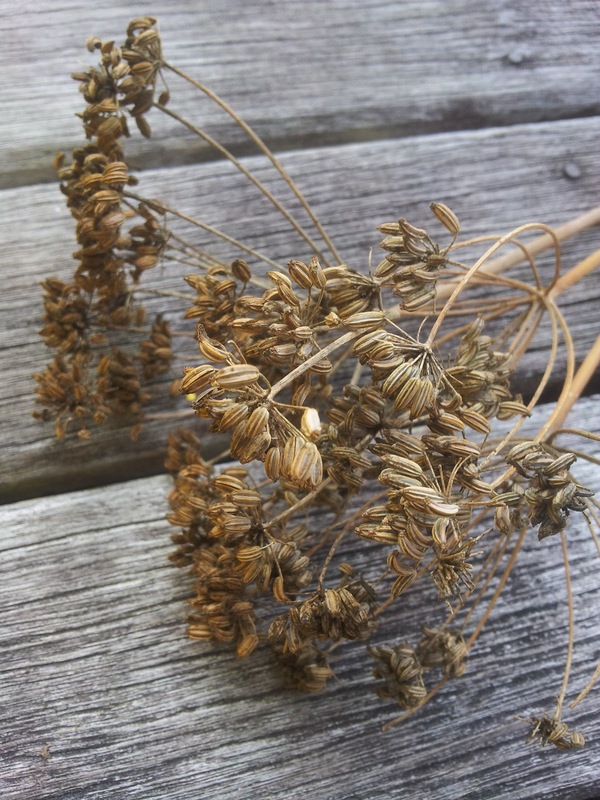 If you forage for these then do make sure that the fennel hasn't been sprayed. 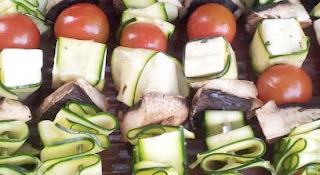 This marinade is excellent to use to flavour cubes of haloumi cheese for at least one hour and ideally overnight before wrapping the outside edge of the cheese with a courgette ribbon. This is a good dish to serve as a tasty vegetarian option. I just added one of these courgette wrapped cubes in amongst the courgette, mushroom and cherry tomatoes simply to make the expensive haloumi cheese go further. Adrian's recipe featured the cubes alone and was served with a tomato and capsicum sauce. I think you could use creamy feta or firm tofu instead. - a photo fromAdrian Richardson's "The Good Life"
Have you ever wondered what is the difference between a zucchini and a courgette? They are both from the family of summer squash. Italians call them zucchini and the French call them courgette. Then the eccentric English like to let them grow into giants and call them marrows. 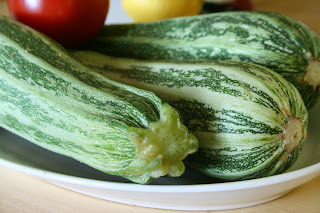 Growing up we only had marrows - a courgette or zucchini unheard of in our house in the 60's. I was never that fussed on the marrow. If only we had known then that we could have harvested the baby marrow like we do for courgettes and let others grow into the monster marrows. In New Zealand we tend to follow the French tradition and call them courgette, but we are also using the two names to differentiate size. Courgette for smaller cigar sized fruit and zucchini for larger fruit. I grew a Kings Seed Italian variety of zucchini very successfully in Dunedin. It's a vigorous, large growing plant that has quite prickly stems. It produces a delicious green stripped and ribbed zucchini, and it is recommended as a variety that grows well into a marrow. One of my favourite soups features zucchini. This recipe is from Lois Daish's "Good Food" cookbook. I would usually make this soup as the evenings start to cool down in the South. In Auckland I felt it was too darn hot to bother with soup but I had to make it for the blog. I was surprised how light and refreshing it was with its tang of lemon. Good news is that it doesn't take long to make. our friend Chris's copper and tin pots that he bought in France 30 years ago. They keep the heat and look so good you could take the pot to the table. Bring the chicken stock to the boil. Slice celery, leeks or onions and zucchini very thinly. Crush the garlic. Add the celery and leeks or onions to the boiling broth. Simmer for 15 minutes. Add the zucchini and garlic and simmer another 5 minutes. Season with salt and pepper. Squeeze the lemons. Add the juice little by little to the soup, tasting as you go. There should be a distinctly lemony tang. Place a spoonful of cooked rice in each person"s bowl. Ladle the soup on top. I didn't have celery but as I used homemade chicken stock that was well flavoured with celery I left it out. 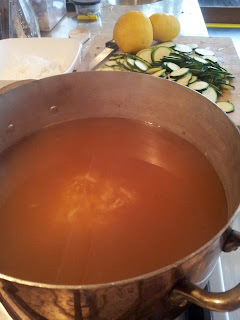 I will do a posting in the winter that will feature making your own chicken stock. 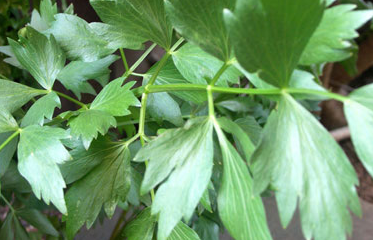 You could also use a stalk of the herb Lovage as a celery replacement but I would tend to just put the leaf in and simmer taking it out before serving, as you would use a bay leaf. a celery alternative esp in soups. The flavour is strong so use with caution. The good thing about not having a shelf full of cookbooks is that I now go to the library to get my recipe inspirations. I have got out many good books but sometimes you get out one that is exceptional. "The Good Life" is a book that immediately draws you to it because of it's presentation from the soft padded hard cover to the gingham ribbon page marker. The photos by John Laurie and the layout are gorgeous. The masterclass sections teach you to salt cod, make salami, focaccia bread (that I have made and was delicious) and the book offers plenty of vinegars, spice rubs, marinade recipes clearly and simply. Adrian Richardson has been a television chef, runs his own restaurant in Melbourne and believes in cooking from the garden. The book is laid out in seasons. 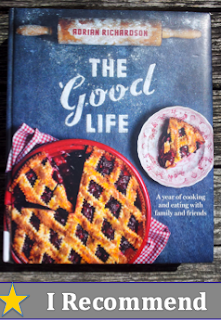 It's an inspirational book making you want to grow more of your own and like Adrian give the next generation "The Good Life" skills. 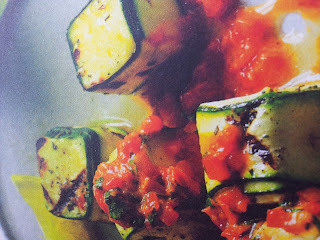 It's good to find different ways of cooking courgettes because they are extremely good for you. The skins have a supply of dietary fibre which aids digestion, prevents constipation, maintains low blood sugar and curbs overeating. Vitamin A and C in courgettes are powerful antioxidants and are effective anti-inflammatory agents deterring disorders like asthma, osteoarthritis and rheumatoid arthritis. They are also beneficial for men for the prostate gland. High in Manganese means eating lots of courgettes will reward you with good skin and fast wound repair. Make sure you select fresh courgettes if you want to reward yourself with all these nutrients. Like in the photo above they should be firm and shiny skinned. They can have small blemishes from mixing with the crowd but shouldn't have pock marked skin. A limp courgette will not deliver all those promised good things. It is recommended you store them in a plastic bag in the vegetable conditioning drawer of the refrigerator and use them in 3-4 days. That is one really good reason to grow these little beauties next summer and, if you are lucky, just like Kerry you will be picking fresh vital courgettes nearly everyday.